Used to switch the motor from GPIO pins. Can be a generic lipo with a standard mini JST connector. The reason the MAX processor was chosen for this project is it has the processing power to handle the large number of audio samples and enough memory to easily apply FFT bucketing on that data and to average that data out in a power-effective way. In conjunction with the charge controller chip, it has the ability to charge over USB, and save power, very necessary attributes of a wearable. This product has many applications in the commercial industrial space for waitstaff, industrial staff, warehouse and factory workers to everyday city dwellers who may not be aware of the loudness of their everyday and can identify what environments are harmlessly loud as opposed to harmful to hearing. This wearable focuses on passively measuring environments. After some limitations with the Arduino library over setting up the SPI master, I decided to use the Arm MBed platform to program the chip and have had no issues interfacing with the SPI chip. I chose the PMod Mic3 component due to the ease of use with the built-in PMod connectors on the Maxim development board. Additionally, it allows for adjustable gain to calibrate the sensor against a known decibel value. The implementation uses subtle lights and averaging to give the wearer a general idea of the actual loudness and not the perceived loudness of their surrounding by fading in red colors for dangerous long-term exposure and also playful feedback with a blueish green with more immediate updates to let the user know if the sound is getting louder or quieter immediately. The LEDs used are the built-in LEDs for this prototype but external LEDs can be added using the same signals for a further implementation as a full-size wearable. Additionally, the board's lower red indicator light is used to indicate low battery status, using the low battery function of the PMic chip. 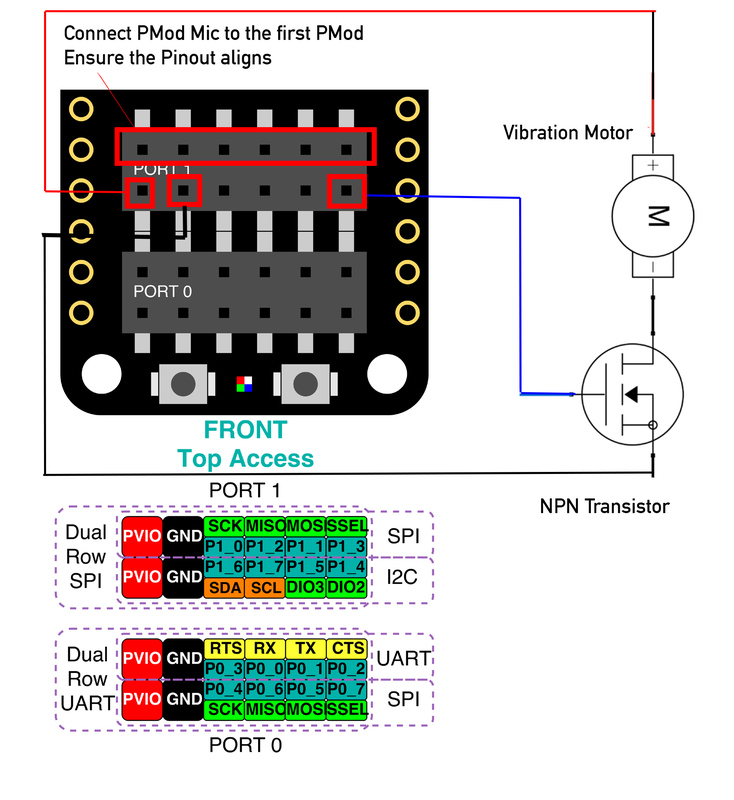 An additional feature of this wearable is if a loud environment is encountered through the large averaging function of the program, every five minutes a slight vibration pattern is triggered using a small motor and a transistor to drive the motor through the PMod connector. By making this product a wearable, it will be more likely for those working in restaurants, bars, and industrial environments where surrounding sound can fluctuate and can be hard to measure. The wearable will not only inform the person wearing the device but also those around them and allow for integration into a piece of jewelry and be able to let the wearer know subtly through small vibrations. This is the main code from the Arm MBED Ide, using the mbed-os and the MAX77650 library.